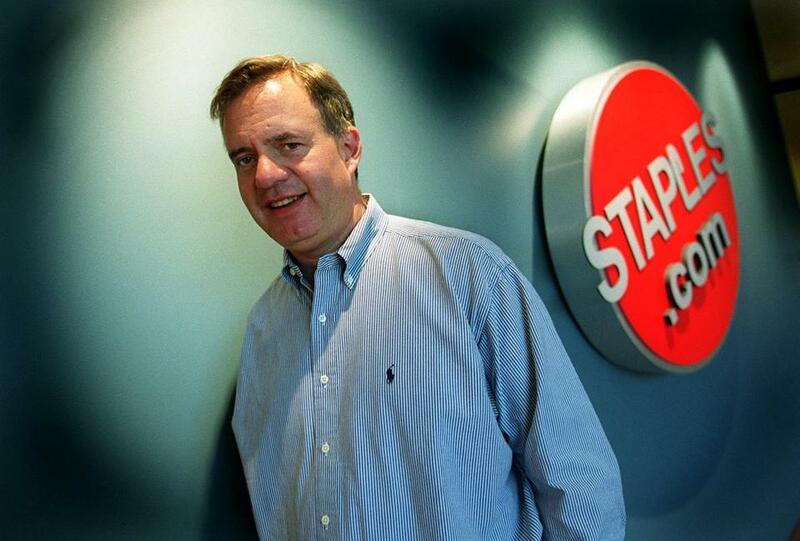 Thomas Stemberg, the founder of Staples, outside the Staples.com offices in 2000. Intense and driven, he was credited with revolutionizing the way office products were sold, creating a chain that now has $22.5 billion in annual revenue and more than 2,000 stores, and at one point employed as many as 91,000 people. He came up with the idea for Staples while driving around in search of a printer ribbon on a Sunday afternoon during the Fourth of July weekend in 1985. He had just been fired as an executive at a supermarket company and needed the ribbon to finish a proposal for a new business. Most stores were closed and his struggle to find the right ribbon led him to an industry changing concept: the office superstore, a one-stop shop for business supplies. With the backing of Bain Capital and its cofounder Mitt Romney, the first Staples store opened in Brighton in 1986. Growing rapidly, Staples took the top spot on the Globe’s 1991 list of the 50 fastest-growing companies in the state, with a sales growth rate of 83 percent. Today the company is worth more than $8 billion. Romney’s backing began a long partnership between two men whose fortunes and ambitions became intertwined. The success of Staples became an oft-mentioned business story that Romney told on the campaign trail as he ran for US Senate, Massachusetts governor, and twice for president. Mr. Stemberg founded Staples with Leo Kahn, who had built the Kahn family’s wholesale business into the Purity Supreme grocery chain. Kahn and Mr. Stemberg were Harvard graduates and devoted fans of the university’s basketball team. Mr. Stemberg later established an endowment to fund the position of basketball coach Tommy Amaker, who has led the team to four consecutive NCAA tournament entries. “While he will be rightfully remembered as a brilliant leader and adviser to a number of wildly successful organizations that employ so many, to me he will always be the man who was there for Harvard basketball, supporting the dreams of young athletes who are better people for his generous devotion to the school and to the game,” Governor Charlie Baker, who played basketball at Harvard, said in a statement. Larry Dicara, an attorney, former Boston city councilor, and close family friend, said Mr. Stemberg was a father figure to many young entrepreneurs and cared deeply about his own nine children. Mr. Stemberg, who was chief executive of Staples for 16 years, took the company public in 1989. Ronald L. Sargent succeeded Mr. Stemberg as chief executive in 2002, and became chairman in 2005, when Mr. Stemberg was forced off the company’s board. “His entrepreneurial spirit and legacy will live on through the many people he inspired and the company he created,” Sargent added. Mr. Stemberg’s success with Staples didn’t always translate into other businesses. In 1998, he founded Zoots, a 24/7 dry-cleaning service that boasted a website on which customers checked the status of orders and scheduled home deliveries. Zoots grew to 75 stores nationally before foundering; it was sold off in pieces in 2008. That same year he cofounded KaBloom, which hoped to become the Staples of florists. The initial vision called for 150 stores nationwide within a few years; today, there are 50 franchises. After leaving Staples, Mr. Stemberg became a venture capital investor and joined Highland Capital Partners, where he was managing general partner and worked on retail deals including Lululemon Athletica, David’s Tea, and City Sports. He also sat on the board of PetSmart. Highland cofounder Bob Higgins, a longtime friend, recalled Stemberg carrying around a worn yellow sticky paper for months with the office superstore concept on it, along with five other retail ideas. Born in Newark, N.J., Mr. Stemberg was the only child of Erika and Oscar Stemberg, who were Austrian immigrants. His father, a restaurateur, died when Mr. Stemberg was 11. Mr. Stemberg’s mother moved the family back to Vienna, where he lived until college. Mr. Stemberg received an academic scholarship to attend Harvard College in 1967 to study organic chemistry. He cofounded the Harvard Independent, an alternative campus newspaper. After graduating in 1971, Mr. Stemberg went to Harvard Business School, from which he received a master’s in business administration. Mr. Stemberg started his career in the grocery business, working for the Mugar family and then for Jewel Co., where he became a vice president at 27. He left the company to run the eastern division of First National Stores, another grocery business. Mr. Stemberg was fired from First National after a disagreement with his bosses, according to his family. Mr. Stemberg’s marriages to Maureen Sullivan and Dola Hamilton ended in divorce. Acrimony over his divorce from Sullivan spilled over into his business dealings when he accused her in a 1997 lawsuit of trying to sabotage a proposed merger between Staples and Office Depot. Romney was called in to testify in that case. In 2009, Mr. Stemberg married Katherine Chapman. In addition to his wife, he leaves six sons, Rylan Hamilton, Darrell Williams, Thomas McDermott Stemberg, William Stemberg, Clyde Stemberg, and Michael Stemberg; three stepdaughters, Madison Eisler, Meghan O’Gara, and MacKenzie O’Gara; and three grandchildren. Plans for a service were not immediately available. In 1996, Mr. Stemberg published “Staples for Success,” a book that charted the growth of his company from a business plan to a growing, successful chain. Years later, he reflected on his approach to business during a 2007 interview with the Globe, a couple of years into his role at Highland. Taryn Luna can be reached at taryn.luna@globe.com. Follow her on Twitter @TarynLuna. Beth Healy of the Globe staff contributed to this report. Correction: An earlier version of this story incorrectly stated the number of consecutive NCAA basketball tournament appearances for Harvard. It is four. It also incorrectly stated the history of Zoots; it was sold off in pieces in 2008.